Raja and Ravi, who are burglars, learn to take a different path in their life after meeting Shiva Prakash, a rich man. 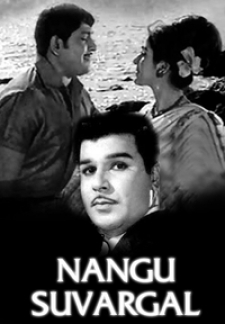 © 2018 Scratchu.com Nangu Suvargal | Jaishankar, Ravichandran, Vanisri, Vijayalalitha - Nangu Suvargal (1971) | Tamil Movie | 5.0/10 | Synopsis : Raja and Ravi, who are burglars, learn to take a different path in their life after meeting Shiva Prakash, a rich man.... Watch Online!! !